Hola! Jolene Navarro, checking in from the Texas Hill Country and today I have a give-a-way so, keep reading. 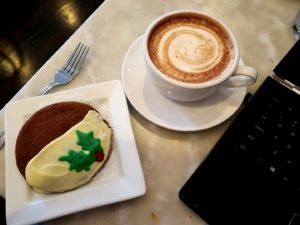 It’s gingerbread and hot chocolate season, so pull up a chair and join me. My mother-in-law was the kind of woman that did more listening than talking. She had a gentle spirit and strong faith. Leaving her home country at a young age with three small children, she followed her husband to a new way of life. I never heard her say a negative word about anyone or complain. When they first came from Mexico they went where the work was. This meant loading up the family and driving to California for the summer to work in the fields. It was a family affair (They had eleven children). My husband has memories of following his mother down rows of vegetables when he was about five, he had his own little bag to fill with whatever crop they were working. Her children will tell you that no matter where they stayed she made the house into a home. Even though as migrants and ranchers they all worked from an early age, what they remember is warm food and laughter. 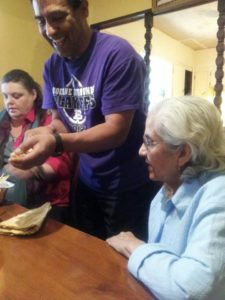 Mom watches as my husband shows me how to make tamales. She was a tiny bit of a woman, standing 4’11” but she held her own. All the kids played sports in school. They were well-known for being good athletes and great students. At one of the basketball games, they had the moms of the players do a free throw contest. To everyones surprise, she won. She was very proud of that trophy and it sat with the many medals her children brought home. In Mexico, she was only able to go to the 3rd grade, but she instilled a value for education in her children. Many of them graduated as valedictorian or salutatorian. This wasn’t because she pressured them or yelled, but she quietly taught by example. She treated others with respect and she did a bit more than what was expected. The door was always open and they had room at the table for one more – or two. In that very quiet way of hers, she was strong-willed and stubborn. She had to be. Leaving everything behind and then raising nine boys and two girls to be amazing adults in their own right can’t be done by the weak-willed. In her home, there were not “her job” or “his job” everyone pitched in and got the work done. They say to not listen to what a person says, but what they do to know their character. Mrs. Navarro was a woman of great character and you can see that in the children she raised. She is one of the women that had the most impact on my life. I see her in the stories I tell. Lone Star Christmas was dedicated to her memory. Te amo con todo mi corazon. The book that is most influenced by her is The Soldier’s Surprise Family. 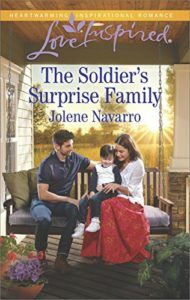 **Giveaway**I’m giving an ebook copy of The Soldier’s Surprised Family to one person that leaves a comment. Jesus and Francisca Navarro came to the United States looking for a better life, ironically they make us a better country. I know she made me a better person. As an adult who has made an impact in your life? Is there someone that made you a better person, built your faith? Hi Jolene, what a blessing to have such a wonderful mother-in-law. What a woman to raise 11 children! 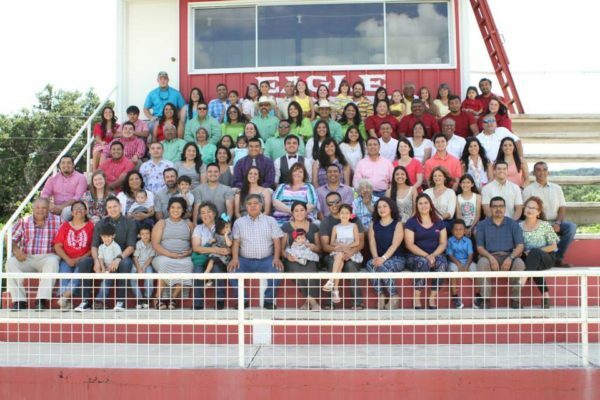 The photo you shared of the family blows me away! My god parents are pretty significant influences in my life, as are my own in-laws. My father-in-law is a wonderful, God fearing man who loves his Lord and his family and I deeply respect and value that about him. Hello, Wemble. Yes, that picture blows me away too. Hi Jolene! Thanks for sharing. The family photo is a wonderful tribute to your mother in law. My mom had a tremendous influence on my life and especially my faith. She had determination to survive and a faith in God to see her through difficult times. She survived the Battle of Kalingrad, now Russia, then East Prussia, Germany. – loosing her family’s farm to the Russians. She worked as a Red Cross nurse through the bombing, holding dying soldiers hands. After that she survived the Berlin Airlift. Then in 1955 we immigrated to a new country and learned a new language adopted new traditions. I am the first person in my family that received a college education. She seldom complained, worked hard, trusted God, and always saw the good in others. Thanks again for sharing an immigrant story. Your stories sound inspiring. Best wishes. Merry Christmas. Hello, Renate. What an amazing legacy. Thank you for sharing. What an amazing mother inlaw you were blessed with! She saynds a lot like my grandma who came from Italy as a child and raised 7 wonderful children! Always worked hard and had good food on the table, I adored her. Those are touching, beautiful thoughts about your mother in law, what a heritage she made for herself! Hello, Dalyn. Thank you. She amazed me. Inspiring story! Thanks for sharing. My grandmother came from France as a young adult so I grew up hearing French and English. My son-in-law is from Mexico so now I hear Spanish from him and my daughter and grandkids. We are truly a nation of immigrants. 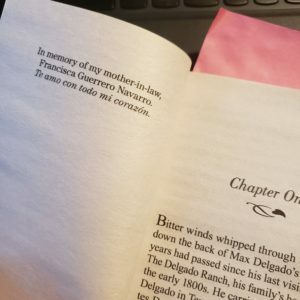 I’ve learned a little Spanish and enjoy listening to it. Hello Diana. How wonderful to be surrounded by so many rich languages. Thank you for sharing. I enjoyed reading about your mother-in-law, Jolene. I can relate because my dad left Mexico at a young age to come work in the U.S. Then later met my mom, married her and brought her to the U.S. where they started our family. My parents are both retired now but I know that both worked hard to provide for us and always instilled in us the importance of getting an education. Thanks for sharing such an inspiring story! A beautiful story and blessed to know her and her children! Thank you for sharing! Thank you for visiting. Fred has many great memories of Coach Smith and your family. Jolene, I can relate!!! My mother-in-love has 10 kids :) Love my family to pieces. Thank you for sharing and many blessings!